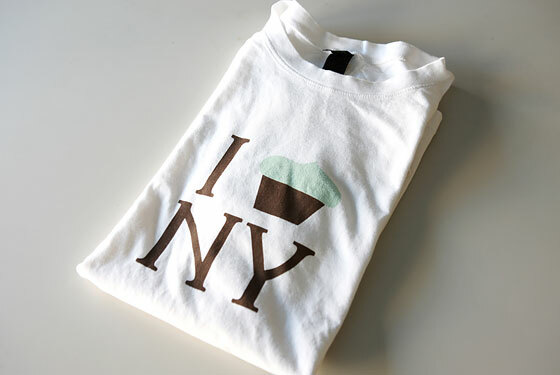 Daniel Maurer at Grub Street admits that he's not so into cupcakes, hence isn't likely to wear this t-shirt. So he's giving it away and the winner could be YOU! Enter now (contest ends tomorrow). And if you just can't wait, go over to Magnolia Bakery's website (updated, which we love, but it still baffles us why the most famous cupcake bakery in the world has not even one image on it!) and you can download an order form - they're $20 each plus $5 shipping (or messenger service in Manhattan). As you probably know by now, we don’t much like cupcakes. Correction: We like ’em just fine (sugar, flour, and eggs, what’s there not to like? ), but we don’t get why so many otherwise intelligent folks would glorify such a pedestrian foodstuff, obsessing over its every possible permutation. It’s not like they’re hamburgers! We realize this might be a problem — a food blog that isn’t "coo coo" for cupcakes is like a fashion blog that doesn’t worship Marc Jacobs (to use the Bleecker Street analogy). So we’re asking you, dear readers, to turn our frown upside-down. The person who e-mails us or comments with the most convincing argument — the sort of argument that makes us bring in a box to the office and send out an e-mail saying “Cupcakes!!!! !” — will win the Magnolia Bakery T-shirt you see here (size large, $22 value). Just don’t send us photos of your Halloween cupcakes. We’ll announce the winner at the end of the day tomorrow. hey.....how can i buy this awsome Tshirt, i would really love to buy one, i'm working in Dumbo at the moment so it's easy for me to fo any were in the city to get this t-shirt.....if you don´t minde, send me an email to tiagomaya@hotmail.com and tell me where can i buy one of these.